a very quick birthday card for my mother-in-law. Not sure why but this is my second water-themed birthday card in a row. Maybe because it's just so silly to have confetti underwater. (Click here to see party fish.) 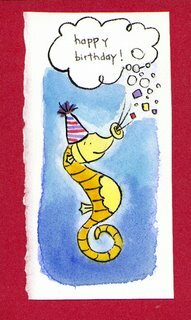 Maybe someday I'll do these up properly and start a line of aquatic birthday cards! you never know!